The five warriors waited in the darkness. Slowly, quietly, the door opened and Gorvodh crept, stealthily, into the room. Lycanmor stood behind him, swiftly bringing a dagger to his neck. The weedy little man froze, letting out a high pitched gasp. His blade glistened in the moonlight. “Drop the knife, Gorvodh” Lycanmor demanded. The advisor followed his order. “Now, turn around very slowly.” Gorvodh turned around, swallowing hard. He looked like an animal caught in a trap. Lycanmor continued, “Donuilson. I need some light in here…” Donuilson obliged, lighting all four candles in the room. “Now I can see what I’m dealing with. You see, Gorvodh, I’m not so cowardly as to cut your throat whilst you sleep.” The General’s eyes pierced into him. Gorvodh sensed that he meant it. There would never be another opportunity. He was ready for death, but he would make sure Lycanmor joined him. Just as the Queen had ordered. In one move, Gorvodh had brought out the concealed dagger from his tunic and plunged it fully into Lycanmor’s chest. The General stared in surprise, and then fell to the cold, pitiless, ground below. Samarfik lunged forward, his dagger always at the ready, but he was too late. Maya had already drawn her own blade and sliced Gorvodh’s throat. Black blood trickled down his tunic, as he fell to his knees. One little gurgle and then he collapsed, face down, on the floor. Dead. The men stared at one another, barely daring to move. Maya collapsed on top of Lycanmor’s colossal chest. He had protected her since she was a child. Now she watched, helpless, as his life ebbed away in front of her. He stroked her hair, lovingly, as a father would. “Maya,” he smiled, whispering, gasping for air. The other warriors crowded round, tears in their eyes. He had been like a father to all of them. Lycanmor looked up at the other men. “Serve your Queen.” Maya looked on disbelievingly as the General exhaled one last time. The room was filled with silence until at last Maya cried out, “It is the Queen who is responsible for his death! For the death of Rodhuan!”, she turned to Rafatheor with blurred and disbelieving eyes. “Why would he say such a thing?”. Rafatheor spoke gently, putting one hand on her arm, “He did not mean Queen Rowena, My Lady.” His brown eyes pierced through to her soul, and she shifted uncomfortably, “Lycanmor was referring to you. You are the rightful Queen. We are here to serve you.” The three men fell to their knees, heads bowed. At last the land of Alba could be seen. The boats relentlessly pushed forward towards the empty horizon. Maya frowned. She hoped the Fomorians would not see them coming and be forewarned. She also knew they would have to hide for as long as it would take the others to get here. Fifty warriors could not start a fight with Queen Rowena. They were about a mile from the shore when one of the warriors in the second boat called out, “Queen! See. All of Erin is here to save us!”. Maya and Rafatheor looked. Sure enough, emerging from behind the giant volcanic rock in the ocean, were a thousand ships or more from The Emerald Isle. Their hearts leapt with joy, and a great cheer resounded as morale was restored. 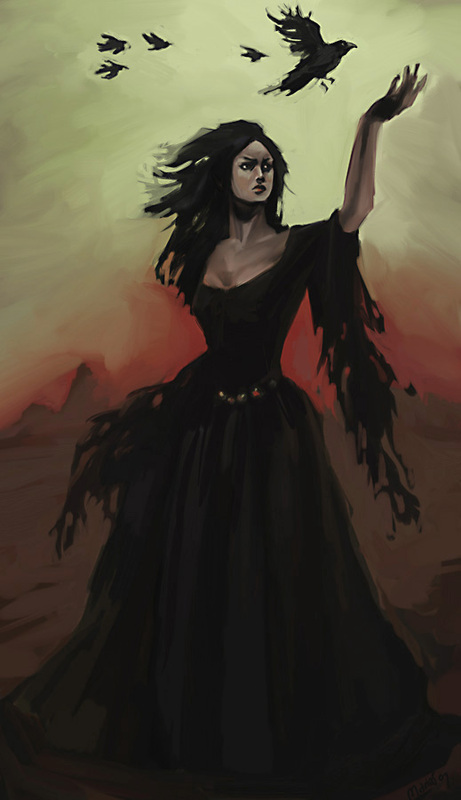 As all the boats began to approach the shore, one person stood alone on the sand, with her black flowing dress of rags, wild black hair, and eyes of fire. The Morrigan. She greeted them with the battle cry, arms raised, clutching a spear. It was fierce and loud, like the cries of ten thousand men. All the warriors responded back to her, with excited and chaotic shouts of ferocity. The cries of the warriors were deafening. Men and women poured out from the boats onto the land. From the forest, Queen Rowena and the Fomorians emerged. The queen’s hair was uncovered to reveal hair whiter than the first snow of winter. In a flash, The Morrigan had transformed herself into a raven, and flew high up into the trees to observe the battle. Thanks Brian! Your support is very much appreciated. Glad you like them. Cheers! Cool! I need to do more research on her when I get round to working on this story. What book is it you’re reading? Is it fiction? Good to know for future reference. Thanks!